Place the oven rack in the middle of the oven and preheat to 325 degrees. Butter the bottom and sides of a 9″ springform pan. Cut a piece of parchment paper to fit the bottom; place the parchment paper in the pan and lightly butter (or use cooking spray). Melt the butter (I use the microwave) just until soft and melted. If you’re using whole graham crackers, break them into even crumbs. In the small bowl, mix the graham cracker crumbs, sugar, salt and butter until well combined and it holds together. Transfer the crust to the prepared pan. Spread initially with a rubber spatula and, then press firmly over the bottom and up the sides (about 1/4″ – 1/2″) using the bottom of a measuring cup (or similar). Set aside. Zest 2 lemons — the peel only, not down to the white part. (I zest mine onto waxed paper.) This will probably yield about 1 tablespoon. Juice the lemons (including the ones you used for the zest) to produce 1 1/4 cups lemon juice. Strain if you have visible seeds or pulp. In the bowl of a standing mixer fitted with the whisk attachment, whisk the eggs yolks and 1/3 cup sugar on medium-high until thick and pale yellow, about 5 minutes. Add the lemon zest and whisk to combine. With the mixer running on low, slowly add the sweetened condensed milk and then the lemon juice and whisk just to combine. Place the prepared pan on a cookie sheet and pour the filling mixture into the crust. Bake for 22 – 25 minutes until the center is set but still a little jiggly. (Mine started to slightly pull away from the sides of the pan.) Remove from the oven and cool on a rack for about an hour. Combine the crème fraîche and powdered sugar until smooth. Spread evenly over the pie. 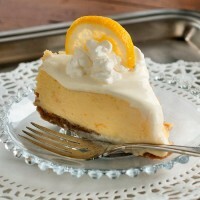 Cover the lemon icebox pie with foil and freeze or refrigerate for 6 hours (or overnight). If the pie is frozen, allow to sit at room temperature for 10 minutes before serving. Garnish with whipping cream and serve. Note: Total time includes 6 hours refrigeration time. A Lemon Icebox Pie doesn’t need to be baked – hence, the name. I am Southern and my family’s been in the South for about 300 years. I’ve eaten Lemon Icebox Pie all my life and love it. My filling recipe is simply two egg yolks, one can condensed milk, and a half-cup lemon juice. The lemon juice “cooks” the eggs. Your recipe made a bigger, deeper pie than mine is, but my recipe is easily doubled.